When you take the time to explore outside your hometown, you'd be surprised with what hidden gems lie just a couple miles away from home. Only a 20-minute drive from my suburban neighborhood, Montage Laguna served as the perfect getaway from the boring repetition of my work schedule. Greeted by the panoramic view of this luxurious resort overlooking the coast of the Pacific Ocean, I was completely mesmerized by the beauty around me. Whether you are looking for a quick weekend getaway or a peaceful place to clear your mind, Montage Laguna is the place to temporarily escape all of your stresses in life. Landscape Photography by Sharon Litz (@sharonlitz). Because spring is finally here, who wouldn't want to adventure the beautiful outdoors more often? Montage Laguna is surrounded by colorful flowers in full bloom, various sized cacti that radiate Coachella vibes, and greenery all around the resort. Sharon and I felt totally refreshed as we casually walked around this gorgeous seaside luxury. After all, a tranquil environment definitely served as a good change of pace from the hustle and bustle of Downtown LA. And what's lunch without an elegant seaside view? Sharon and I dined at Mosaic Bar And Grille, a California-inspired oceanfront restaurant that carries various salads, grilled sandwiches, and fresh seafood. We ordered the Mosaic Nachos and Avocado Pita, two colorful options that looked as good as they tasted. After our delicious lunch, you can already guess that we explored the vicinity like two giddy kids in Disneyland (oh wait, that was actually us last week LOL). Everybody's favorite area to take photos had to be by the cliffside. 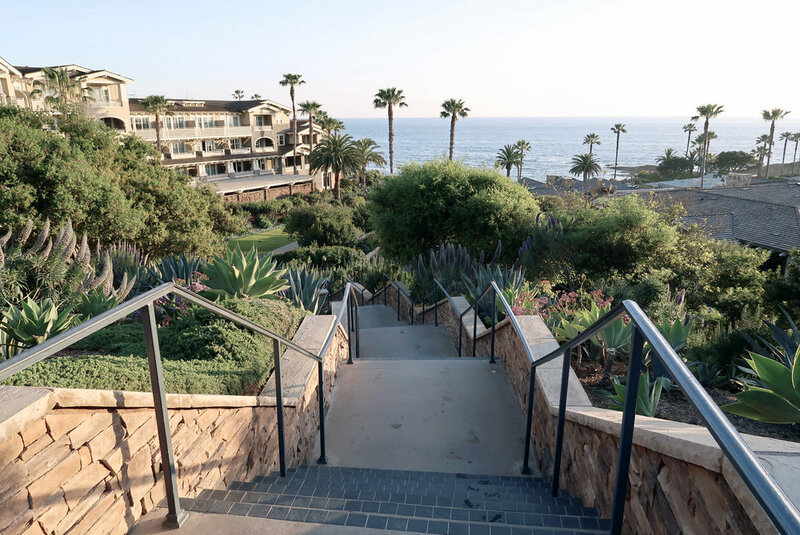 In fact, this is the prime spot to catch the best view of Laguna Beach from one hundred feet above ground level. Feel free to lean over the wooden balcony to take in the view, but be sure not to fall! I loved taking portrait shots with Sharon at this one specific spot since you are able to capture yellow flowers peeking from underneath the wooden fence all the while taking in the bokeh of the beautiful beach landscape. Not only is the Montage Laguna resort relaxing enough to take friends and family, but it is also romantic enough to bring a date or loved one for a scenic walk along the cliffside. I already know for a fact that this won't be our first and only visit. In fact, Montage Laguna has so much beauty to offer that it has to be visited more than once in a lifetime. With that, I'll see you soon Montage Laguna. *Use discount code Michelle10 for 10% off your entire Shop BEXO purchase at the checkout screen. Purse: San Diego Hat Co.
*Use discount code HELLOSPRING for 15% off your entire San Diego Hat Co. purchase until 4/30. *Use discount code missmisschelle for 35% off your entire De Blossom Collection purchase at the checkout screen. *Disclaimer: Collaboration supported by Shopping Links.